Last week we kicked off our seventh annual 100 ACTS OF KINDNESS CHALLENGE and it has been amazing to see all of the wonderful acts of kindness that everyone has been doing! Last week, Megan at Coffee Cups and Crayons issued our Week 1 Kindness Challenge and shared a special way that we can serve Senior citizens. This week I get to share our WEEK 2 KINDNESS CHALLENGE with you! For our challenge this week, we are encouraging you to play the kindness game with your families or students! 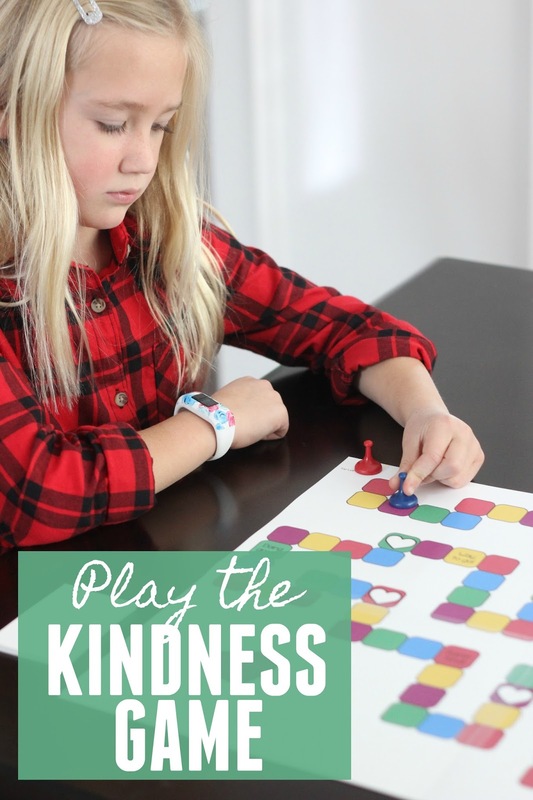 Scroll down to get our free printable Kindness game and read more about how to play. I read the most wonderful article this week about 5 ways to raise your kids to be kind. Many of the ideas just reiterated why this kindness challenge is so important to me and our family. Two of my favorite ways include being a strong role model and mentor and expanding your child's circle of concern. Teaching kids basic principles like gratitude and caring for others is also important! This week, as we play our kindness game, you will have the ability to adapt the game for your child's age and abilities. To get started, you'll need to print out the game board and cut the pieces to make them fit into a game board that looks like the photo below. Next, you'll need to cut out the game cards and kindness challenge cards. I recommend printing two sets of each cards. This game was created for us by Kim over at Life over C's and she recommends that you print the cards onto a piece of cardstock that has a pattern on one side... so that you won't be able to see the cards through the cardstock. We kept ours blank... but I will probably reprint them soon. Once you have everything taped and printed out, you'll want to create your Kindness Challenge cards. These are special cards that players can select when they land on a heart on the gameboard. You could choose to keep your board game out all week long and make these challenges harder ones (like donating toys or taking treats to a friend), or you could sit down and play the game in one sitting and work on simpler kindness challenges (like giving someone a hug, paying someone a compliment, or going to do a secret act of kindness for a sibling or friend nearby). Megan at Coffee Cups & Crayons has a fabulous and comprehensive list of big and small acts of kindness that you could use to fill out your Kindness Challenge cards. We have several other examples of simple acts of kindness on our 100 Acts of Kindness Pinterest board. Once your cards are written out and you've cut everything out, you are ready to play! Grab a few friends and set your markers in the top of the left part of the game board. If you want to make it really clear, write START in the top left corner of your game board. Each player can choose one card on their turn. Make sure the heart cards and the kindness challenge cards are face down when you get started. The number and color of hearts on your card determines how many spaces you move! If you get two purple hearts, you move to the first purple space and then jump to the second. Once one player goes, it is the next player's turn. I recommend going clockwise around the table and letting each player take a turn. If a player lands on a white heart, they get to choose a Kindness Challenge card. In order to continuing playing, they need to accomplish the Kindness Challenge. This is a fun game to play all week long as a family. You can work together to help each other on the Kindness Challenges. 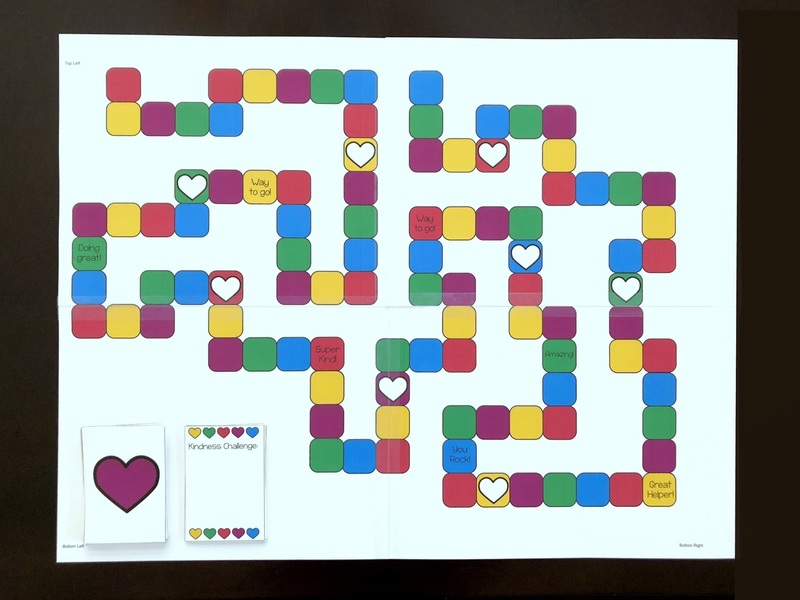 To win the game, a player needs to move across the entire game board and end in the top right blue spot at the end of the kindness path. If you want to make that extra clear, write "END" on the blue spot on the board. This game is so fun to play together with students or your family! By providing kids with opportunities to practice caring and gratitude, you truly are helping to raise kind kids! If you have any great ideas that we should add to our kindness challenge deck, pass them along in the comments! Don't forget to DOWNLOAD THE KINDNESS GAME BOARD & CARDS HERE!! I can't wait to hear what simple acts of kindness you do this week! Make sure you join our 100 Acts of Kindness Facebook group so that you can share your ideas and see what other people are up to as well!